I think I have something wrong with me. I seem to be afflicted with a particular malady that forces me to buy way too many summer fruits when they’re in season. It gets particularly dire when faced with apricots and cherries, two fruits whose seasons are much shorter than the others. The first fresh apricots I saw were back in upstate New York, around the 1980s, and I’d never seen them before. Someone brought us a basket of the tender, squishy little orange fruits to the restaurant that I worked at, and I remember being completely taken off guard, as the only apricots I’d ever seen were the dried ones. And while I loved the crinkly dried specimens, those fresh beauties with a red blush were a whole other taste entirely. Then, when I moved to California, I discovered how abundant fresh apricots are (or can be), as they are in France. 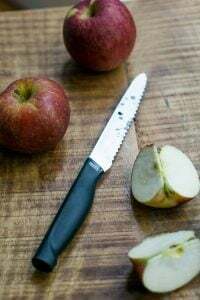 But no matter how abundant – or not – cherries are when the season is in full swing, I always consider them extra-special fruits and give a prominent place in my kitchen. At the beginning of the season, they’re incredibly expensive and rarely good. 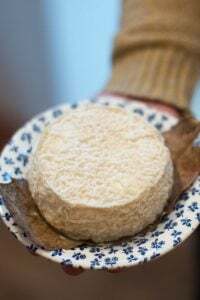 Then, as the season moves along, they start showing up in larger mounds at the market, and the prices get gentler, coaxing me to buy as many as I can heft. Fresh cherries are, of course, great fresh. 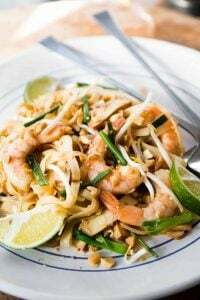 But cooking them can deepen, and even improve their flavor, especially nice if you get home and find yourself with a bag of rather wan ones. 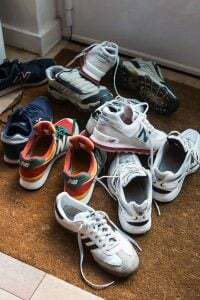 Or ones that you might snag at the end of the market, when the vendors are trying to get rid of any extras that might not keep until the next market day. And let me tell you, it’s great to stumble upon a bag of cherry compote that may have moved to an unfavorable position in your freezer as summer shifted into fall – or winter, when they can become quickly forgotten. Once defrosted, and perhaps rewarmed, they’re terrific served with vanilla ice cream, plain yogurt, or alongside a cake, such as almond cake, gâteau de savoie, or angel food cake. I like to boost their flavor with a handful of dried sour cherries, added midway during cooking, so they plump up and absorb the cherry juices, which add another dimension of cherry flavor. A shot of kirsch also dials up the flavor nicely. Be sure to use a larger pot that you think. For 2 pounds (1kg) of cherries, I used a 6-quart (6l) pan. 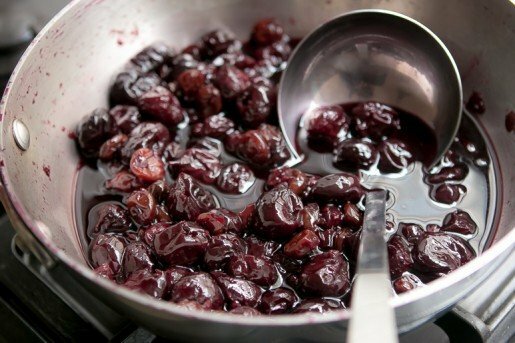 Since the cherry juices will foam up as they cook, using a larger pot – and removing the lid from time-to-time – will keep your from having to clean up a sticky mess.I’ve didn’t use much sugar here, so you can add more to taste, if your cherries aren’t as sweet as mine were. If you can get sour cherries, feel free to add some in place of the sweet cherries. If so, you may need to increase the sugar a little, to taste as well. 1. Stem and pit the cherries. Put them in a large, nonreactive pot or saucepan and stir in sugar. Turn the heat to medium, cover, and cook for 10 minutes, lifting the lid and stirring them frequently, to encourage juicing and to make sure the liquid the cherries exude doesn’t foam up and overflow. 3. After 10 minutes of cooking, add the sour cherries, if using, and cook for 5 to 10 more minutes, until the cherries are wilted and completely cooked through. 2. Remove from heat and stir in the kirsch and almond extract. Let cool before storing or serving. The juices will thicken as the compote sits. Storage: The cherry compote can be stored in the refrigerator for up to 5 days. It can be frozen for up to one year. 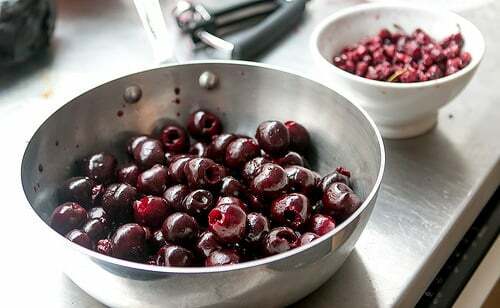 Would love to cook with fresh cherries (like you said, the season is short, and they do seem to go south faster than most fruits) but I’m a little intimidated by all that pitting. And don’t want to buy a new kitchen doo-hickey just for that purpose. You can actually use a regular paperclip to pit cherries. They work pretty well. Just unbend one, and open it up, then use one of the rounded ends to stick into the cherry (when the stem was), and pull out the pit. It’s pretty easy, although a cherry pitter is a bit faster – and in some cases, less messy. You could be describing me — I’ve been staggering home from the market with sacks of apricots and cherries for weeks now. Towards the end of the season, cherries can be under 2 euros/kilo. I love having cherry compote on hand almost all year, it is worth all the pitting. 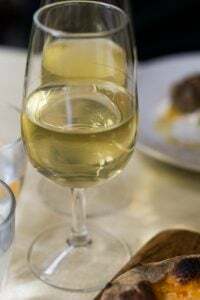 I make divine compote with apricots too; halve and stone them, a quick saute in olive oil, scrape in the contents of a vanilla pod, add a glass of Muscat and a sprig of rosemary, cook for about 20 minutes till mushy. Superb with Greek yoghurt or ice cream. Hi, David! I just tried this but used honey instead of granulated sugar. Was totes awesome! Glad for the excellent news about freeze-ability. Will definitely try this soon! Thanks for another great post! I am like you, I can’t resist fresh apricots and cherries. I made your sour cherry jam a couple of weeks ago and it is divine. I picked the cherries from a friend’s tree. As to freezing cherries I like to put them on a flat sheet in the freezer. The next day I put them in a ziplock bag. Freezing them like this prevents them from sticking together. I also have done this with strawberries. I haven’t had a compote in too long! This would be a great recipe to break that chain with! I am waiting for the price to go down… yesterday at the market (Catalonia) cherries were fetching 5,80 euros per kg! Ohhh I am so with you – I just love cherries, they are my favourite summer fruit. In a day and age where you can have everything at any time, they are one of the things you just have to wait for and savour it while you can. Our Farmer’s market had the 1st cherries this morning! I had just bought 4 quarts of organic strawberries at another stand (last week for strawberries). But, HAD to buy the cherries as well! Have been making strawberry jam & batches! of strawberry ice cream from The Perfect Scoop. AND the raspberries are coming in! Don’t you just LOVE fresh berry season? Thanks for giving us another way to use them! Have yet to restrain myself from demolishing all the fresh cherries in order to have some to freeze – I do love adding frozen cherries to a banana smoothie in deep winter – so good. 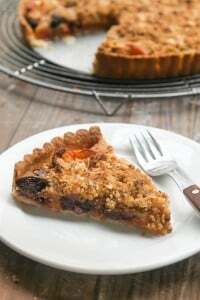 I used to bake an apricot tart that I lost the recipe for, in which a sort of pound cake was crumbled into a sponge tart shell, topped with halved apricots, baked then brushed with apricot jelly. I made this during school summer holidays and it was so good. Cherries would be great added to the apricots. Ah, how delicious! I’m so glad you didn’t use a lot of sugar. Honestly, I can eat two kilos of cherries in a few minutes… love them so! Lovely, lovely, lovely. This will be also fabulous with panna cotta! I can’t bear to do anything to fresh cherries, except eat them fresh! Your description of the cooked cherries sounds intriguing, though, so I might just have to try this compote. Or you can use cherries in clafoutis. Super easy, and traditionally you don’t even pit the cherries. Every year we also make a new batch of cherry bounce, an infused bourbon based cordial. Love to eat them plain, or make a milkshake with them. Cherries! How I, and gout, love thee! What a delicious sounding recipe. 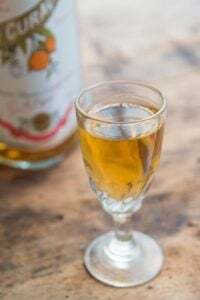 Do you remember Cherry Tree Cider in Sonoma? I have tried, to no avail, to track down the current owner of the recipe. From what I can remember, it was an old German recipe. Seriously, I consider the closing and altering of the original Cherry Tree Cider recipe one of northern California’s greatest atrocities. Here’s a great cherry pitting hack. Just place your cherry on the top of a bottle. That secures the cherry in place. Then use a chop stick to push the pit right into the bottle. Simple and no mess! Fresh apricots are almost impossible to find near me that possess any fragrance or flavor much to my dismay. I have fresh sour cherries from the local farmers market: can I make the compote as directed, perhaps just adding more sugar? As much as I want to make another crumble, I’d like to enjoy these during the long winter. Lucky you! Yes, absolutely. 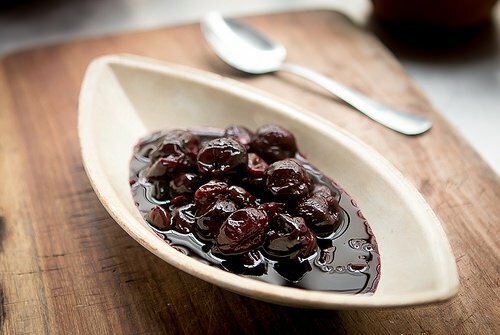 Sour cherries tend to cook quickly, so you’ll likely need to adjust the cooking time. They can also throw off a lot of (delicious) juice, so you may end up with more liquid. Thanks, perfect timing. I just bought pounds of WA state cherries @ only $1.77 lb. a deal I thought, because about a month ago they were $7.99 @lb. RB. But I do love apricots and fresh ones are rare or pricey. Last year I was in the Lot – France, visiting my friend in a small village. We went for a walk and she took me down a path thru the woods. All of a sudden we came upon a small stone cottage with a humungous apricot tree! Loaded with ripe fruit! A dream? A ba-zillion of them. It stopped me dead in my tracks. She kept walking and finally stopped because I was there staring with my mouth open at the tree. I did not have a camera either. I asked her if she knew the people that lived there and she said yes – an elderly woman, but just in passing. I wanted to know if we could ask her if we could buy some and she told me no- that would not be right. If people know that you want something they will give you a high price. Is that a French thing? But what would she do with all of them? Sell them? Or just let them drop to the ground and rot. So so sad. When we got home there was a big case of beautiful prune plums that another neighbor left for us from her tree. So all was not lost but I still think about all of those apricots. In case I come upon a deal-what are you doing with your apricots? Love them, especially raw – I just made a black cherry and blueberry crostata (only 3 tablespoons of sugar)…so so good! I don’t have a cherry pitter! Time to get one, especially with cherries being at an all time low price. Any suggestions for a brand or type. Also, I am wondering what sort of recipes do you have for pluots? My sweetheart has a tree of them ripening, and it’s a bumper crop! 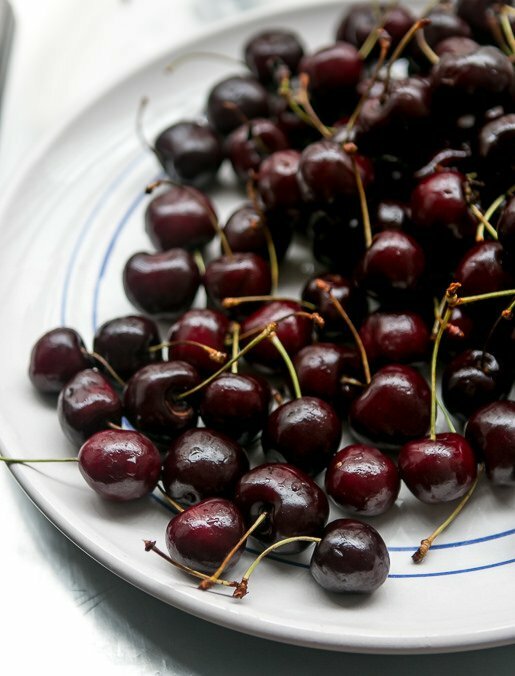 I never get to cook the cherries because I eat them like candy, or as we call it in Turkey like “sunflower seeds”… They are addictive once I start eating them. My problem in US is that I can not find fresh sour cherries! At least in SC. David, I’m totally immersed in my organically, homegrown apricots. As a former Midwesterner who moved to California, I am taking full advantage of the weather and the mini-orchard my husband has planted. We have an embarrassment of riches here and I am loving every minute of it. Our variety of apricots only bear fruit every other year so it makes my crop especially sweet. Thank you for sharing your love of fruits. Truly a blessing from Mother Nature. Will definitely freeze some of our California cherries, too. Excited to be in Paris next week and know that so many of the things in season in Toronto are in season there… should be a nice stroll through the local markets — I can’t wait to taste what’s on offer! Thanks for this, David! I love the idea of not worrying about making them into jam and getting the set right (I always seem to overcompensate with cherries and my end result is usually very stiff). Could I can this compote, though? I have more jars than freezer space. btw, I like to flavor them with lime and gin! David, I am exactly the same way about cherries and apricots. I cannot tell you how much I love apricots. Alas, the season is way too short. They are beautiful and delicious fruits. I also buy way too much fruit. I live in San Diego and all the fruit hitting the stores like Sprouts, Windmill Farms, Whole Foods, etc., is beautiful and plentiful. 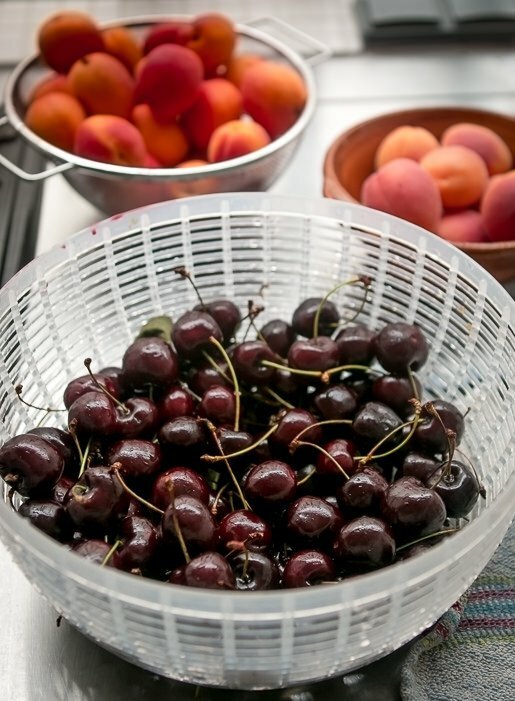 I am buying apricots, cherries, grapes, and tomatoes by the bucketful because when the season is over it is hard to find any of these that have any flavor. I love summer produce and can never get enough of it. Loved all your recent travel posts. Just took this off the stove to cool. Smells soooo good. I can’t wait to try it on vanilla ice cream this evening. Or you can just freeze the pitted cherries and make compote or clafouti or whatever else with them later on. They freeze fine. Another great use is to fill an empty mayonnaise jar with cherries, pour in brandy, and let is sit in the fridge for a couple weeks. It’s both a wonderful aperitif and digestif. Yum! Apricot and cherry jam is fabulous, great colour and taste. I use 1kg apricots and 500 gr cherries and usual jam making method. It’s been too long since I’ve made a Cassata (sp). I must get cherries and macerate them in kirsch along with some currants. Heaven, defined. Cherry compote sounds divine. I can’t let this household know about it until after the fact. What will be my greatest challenge is hiding the fruit from them. A bag of cherries causes a free-for-all around here! You can save time and wear and tear on your wrists by freezing the whole cherries, thawing them, then squeezing the pits out. I’ve found that jam is less likely to scorch at the beginning because of the juice given off during thawing. I buy truckloads of cherries for jamming and fresh eating and save my trusty OXO for the odd pie. That compote seems like a great way to celebrate the cherry season. I finally bought cherries this week, after eying them for a month. I had to be patient because in my opinion the late-may/june cherries can be 1, way too expensive (about $7-8/pound!) and 2, not that good. Take your compote to the fire station to celebrate the Bastille day! There’s such a plethora of choices of cherries in Paris. But I do not have a decent size freezer unfortunately or even a normal size freezer so I’m stuck eating endless cherries. I just broke down and bought a cherry pitter this summer. It isn’t an Oxo. It is the only one Bed and Bath had at the time, so I bought it. I resisted last summer because I too didn’t want to add another gadget to my arsenal, but, after using it, I am more appreciative. I like to brandy my cherries to have for Manhattans. The cocktail…. When I discovered I didn’t have to put up with those horrible Marachino thingys, I rushed out and bought cherries last year and brandied them with the pits. Worked out fine, but, thought this year I would add a little class. My gadget pits 4 at a time with one stroke. LUV IT. Makes pitting really fast. I heat them briefly with a little simple sugar and let them cool and pour in enough brandy to cover, add a little ruby port and some orange rinds and seal the lid and keep it in the fridge. I like to let it marinate for at least a couple of weeks before I try them. But they last beautifully and I feel very up-town serving Manhattan cocktails with my own brandied cherries. Delish! AND you can use the cherries for desserts too. I just made it – delicious! Thanks for another great recipe, posted at the perfect time! no-one should resist fresh cherries! we certainly can’t and have fond family memories of driving up a sunny valley in the south island of new zealand, heading inland into stone fruit country, stopping at every cherry stall along the way, buying some of every sort, deeply dark ones, red one, and the sweetest yellows with a blush, and eating them in the car, spitting the pits out the open windows, the small fry delighted in this but often missed and by the end of the trip everyone was stained purple and blissful. no digestive reprcussions either considering the amounts we ate! I haven’t had the patience to pit a bunch of fresh cherries. And, quite frankly, I prefer to just pop them in my mouth and enjoy them in their raw state. But I always, always, have a few bags of frozen organic cherries in my freezer and use them to make an impromptu crisp or crumble. so delicious. I like this cherry pitter a lot. It is easy to use, and easy to clean. As soon as fresh cherries are affordable, I bring a big bag home and eat so many that I get a stomach ache, but I can’t help it. Your cherry compote sounds amazing over ice cream. 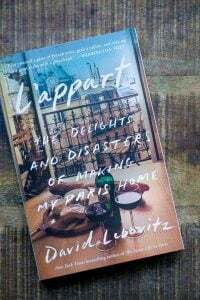 On another note, a package arrived in the mail last night – My Paris Kitchen – a birthday present from my parents, and I was so excited to flip through it and see all the wonderful recipes. I can’t wait to sit down and read it, and then the hard part – deciding what to try first! I too have your summer fruit malady. Cherries, apricots, and peaches, oh my! I cut up all three, add some chopped banana, a dash of cinnamon, and some pecan pieces. Great on a multigrain waffle. Thanks for this compote recipie. Looks wonderful! I have a CHERRY watercolor with your name on it. Made this recipe as soon as I read it and am now addicted. Made an almond cake at the same time but the compote was so delicious that I am just eating it with a spoon. 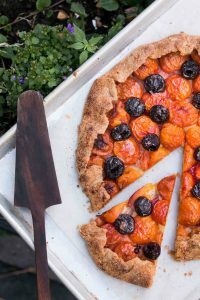 Wondering if you have similar recipes for other stone fruits like plums and peaches? I wrote a book, Ripe for Dessert, which is filled with recipes for using fruits of all kinds, including stone fruits. It’s out of print, although you can find copies online. And some of the recipes were updated and reprinted in my book, Ready for Dessert. 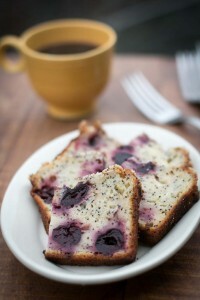 I love cherries & I think this recipe is amazing.. So definitely I try this. Thanks for this outstanding post. These sound Devine !!!!! My favorite cherry recipe is my cherry brandy jam!! Heh – this, almost to the letter, is my recipe for cherry jam. We only get dark sweet cherries here in LA so they must be “tarted up” with dried sour cherries and (for me) a shot of balsamic vinegar. I don’t have a cherry pitter so stoned them all by hand, which was a pain. Still, the resultant jam is pretty special. Great minds, etc. Another alternative cherry pitter: a really sturdy straw. Just center it and push it on through. Works great! These comments continue with questionable solutions for pitting cherries. The last, a straw?? My pitter cost $9.99 at Bed and Bath. The brand is Progressive. It is plastic, about the size of a rectangular butter dish with the lid. IT DOES 4 CHERRIES AT A TIME! What could be better? It stands up on end in its box in a corner of a drawer to save space. It is maybe 6 inches high. So takes no space and is FABULOUS!!!! I wish cherries and apricots were as cheap here in Eastern NC. $3.48 per pound for cherries. Apricots are $2.98 per pound.